All grains start life as whole grains. In their natural state growing in the ﬁelds, whole grains are the entire seed of a plant. This seed (also called a “kernel”) is made up of three edible parts – the bran, the germ, and the endosperm – protected by an inedible husk that protects the kernel from assaults by sunlight, pests, water, and disease. 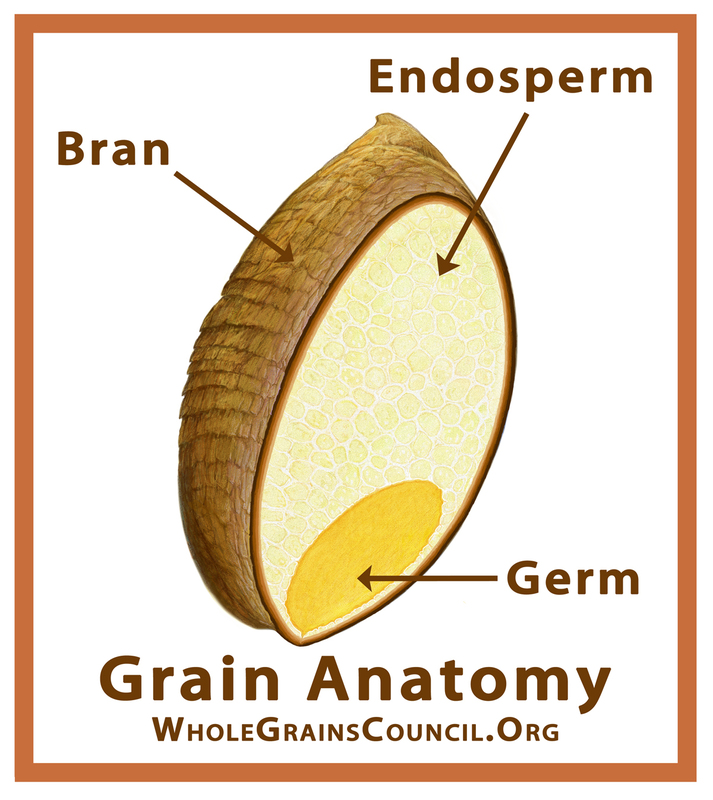 A grain is considered to be a whole grain as long as all three original parts — the bran, germ, and endosperm — are still present in the same proportions as when the grain was growing in the ﬁelds. The bran is the multi-layered outer skin of the edible kernel. It contains important antioxidants, B vitamins and ﬁber. The germ is the embryo which has the potential to sprout into a new plant. It contains many B vitamins, some protein, minerals, and healthy fats. The endosperm is the germ’s food supply, which provides essential energy to the young plant so it can send roots down for water and nutrients, and send sprouts up for sunlight’s photosynthesizing power. The endosperm is by far the largest portion of the kernel. It contains starchy carbohydrates, proteins and small amounts of vitamins and minerals. “Reﬁned grain” is the term used to refer to grains that are not whole, because they are missing one or more of their three key parts (bran, germ, or endosperm). White ﬂour and white rice are reﬁned grains, for instance, because both have had their bran and germ removed, leaving only the endosperm. Reﬁning a grain removes about a quarter of the protein in a grain, and half to two thirds or more of a score of nutrients, leaving the grain a mere shadow of its original self. Since the late 1800s, when new milling technology allowed the bran and germ to be easily and cheaply separated from the endosperm, most of the grains around the world have been eaten as reﬁned grains. This quickly led to disastrous and widespread nutrition problems, like the deﬁciency diseases pelagra and beri-beri. In response, many governments recommended or required that reﬁned grains be “enriched.” Enrichment adds back fewer than a half dozen of the many missing nutrients, and does so in proportions diﬀerent than they originally existed. The better solution is simply to eat whole grains, now that we more fully understand their huge health advantages. 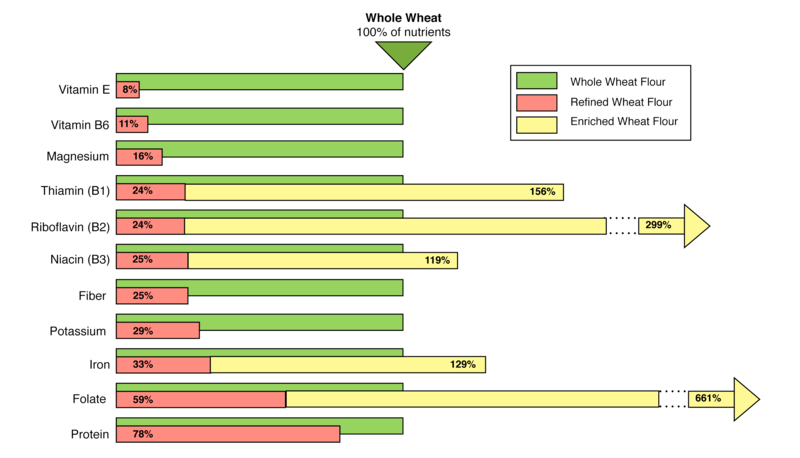 The chart below compares whole wheat ﬂour to reﬁned wheat ﬂour and enriched wheat ﬂour. You can see the vast diﬀerence in essential nutrients. Whole Wheat vs. Whole Grain – What’s the Diﬀerence? Everyone knows that all carrots are vegetables but not all vegetables are carrots. It’s similar with whole wheat and whole grain: Whole wheat is one kind of whole grain, so all whole wheat is whole grain, but not all whole grains are whole wheat. “Whole grain whole wheat ﬂour” would be redundant in the U.S.A. — whole wheat ﬂour is always whole grain in the States. But not in Canada, so be aware.